Tonight we took the kayaks out for a 2 hour paddle on Lake George in the Adirondacks of New York. We launched from Route 9L at Warner Bay where there is a gravel pull-off from the road and a small strip of state land where you can launch. Our itinerary just to paddle up the eastern shore of the lake until we had to turn around towards sunset. We launched about 5:45 PM and made our way northward. After an hour, we passed Elizabeth Island, a privately owned island that has some houses on it. We paddled a little further and went past Travis Point, the Triplet Islands, and Echo Bay before reaching a small state owned island just south of Barber Bay named Whipple Island. At the island we pulled the boats ashore and went for a swim. The island is small and was named in 1908 when it was discovered that it didn't have a name. The islands were receiving new signs at the time and the island was named after State Forest, Fish and Game Commissioner Whipple. The island has a fire ring, but fires are probably not allowed on the island. After the swim it was time to make a beeline back to the car. 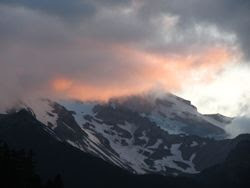 The night had become a little overcast, so there was no dramatic sunset. Still it was a great night to be in the boats. We got back to the car around 8 PM after a nice paddle. As we were paddling back, it seems everybody was grilling at their waterfront homes and the smells were fantastic. We had eaten before we started out, but we were hungry again. I was ready to pull up to the boat slip with the best smelling food. You can see the route here on Wikiloc or below on EveryTrail. In my opinion, the summit of Hopkins Mountain, located just east of Keene Valley, NY in the Giant Mountain Wilderness, might have the best view of the Adirondack High Peaks from a non-high peak summit. The summit is only at an elevation of 3156', but since both trailhead choices on Route 73 are at around 1000' it is still a good workout to reach the top. We chose the Ranney Trail. The one way hike distance to the top is only 2.9 miles, but it is a steady uphill once you get to the trailhead from Ranney Road. We parked across the street at the Rooster Comb parking lot since the Ranney Road street sign said private road. We walked straight in on Ranney Road (a level gravel road that immediately crosses the Ausable River on a small truss bridge). It is not obvious where the trailhead is located, but if you continue to walk straight you will see the sign pictured below. Last October, we had done a phenomenal traverse of from New Russia to Keene, by climbing Bald Peak, Rocky Peak Ridge, Giant Mountain, Hopkins Mountain and down to Beede Road. We hit Hopkins just before sunset and it was awesome (see comparison fall sunset pictures here). We didn't linger too long on that day, but knew we wanted to go back, just to see Hopkins again. This was our day to do just that. The Ranney Trail crosses Hopkins Brook several times in the first half of the hike and passes through a nice pine forest before returning to hard woods until the trail from Giant Mountain is reached, .2 miles shy of the summit. From there, it is a short steep climb transitioning into soft woods. Hopkins doesn't get a lot of traffic since it is not on a peak list. The summit ledge is quite large, so even if someone else is there, you can spread out and have your own space to admire the view. Last October, we desended without climbing Spread Eagle Mountain, so this time we hopped over there to gain the views from a different angle. You can still get mostly the same view, but Hopkins definitely provides the best panorama. It had taken us about an hour and 40 minutes to reach Hopkins and another 25-30 minutes to go over to Spread Eagle. This hike roundtrip is a nice half day hike. During the day we saw 2 couples, both with children that were perhaps in the 6-9 age group. They all seemed to be enjoying themselves. After we returned to Hopkins and had our fill of the view we returned to the trailhead the way we had come in. A new tree is needed! The weather had been a mix of sun and clouds which made for some interesting skies. The bugs were not a problem and we totally enjoyed the day. 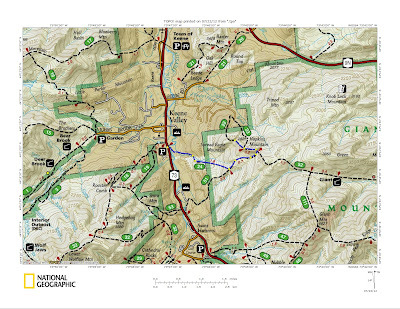 The Bread Loaf Wilderness in Vermont is the largest wilderness area in the Green Mountain National Forest. It contains approximately 25,000 acres. It is home to several of Vermont's 3500 foot peaks and the Long Trail passes through it. What else is there? How about mountain shelters and a high elevation pond. That was enough to convince Leesa and I to cross over into Vermont for a day of hiking and it's time we do more hiking there. For this hike we chose the Skylight Pond Trail which goes from Forest Road 59 to the Long Trail at which point it crosses the LT and travels a short distance further to the Skyline Lodge and Skylight Pond. We set off down the trail at 10 AM. The trail was smooth and dry and an easy trail to walk on. We were anxious to visit the Skyline Shelter, so we made our way there first. 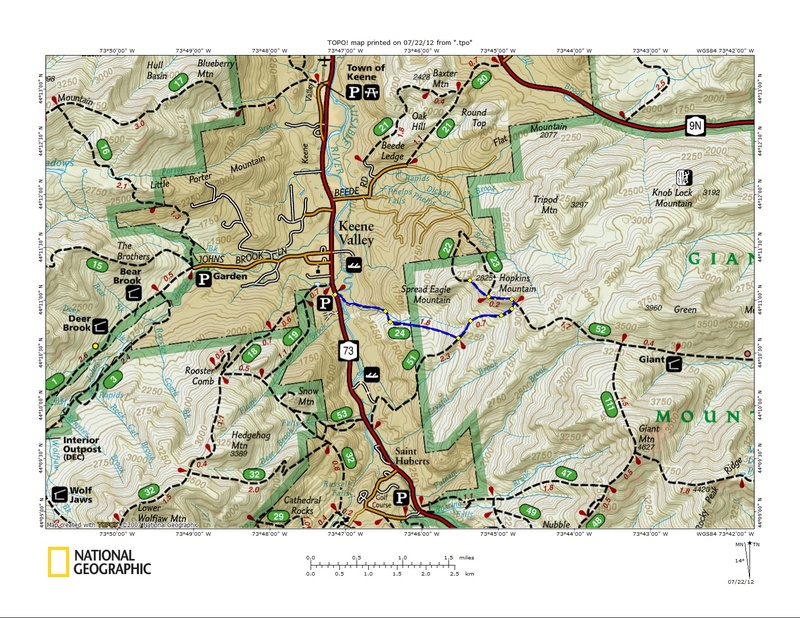 The Shelter is 2.5 miles from the Trailhead and slightly downhill from the Long Trail. We reached the shelter after 1 hour and 15 minutes from the trailhead. What a nice shelter! It sleeps 14 and has a lower platform and an upper platform, along with a table and bench. In the corner is a locked caretaker's box. Outside is a nice front porch and a view of Skylight Pond. There is also a brand new privy! Overnight accommodations are on a first come-first served basis and there is a $5/person charge. In our opinion, it would be well worth it. It is a nice facility. 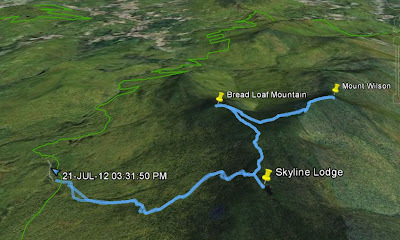 After enjoying our lunch at the shelter, we returned to the Long Trail and headed north to Bread Loaf Mountain (3835'). From the point of the Bread Loaf Spur there is a nice view. We were at the point just after 12 noon. From Broad Loaf Mountain, we continued northward to the junction with the Emily Proctor Trail and the Emily Proctor lean-to. We stopped there for a snack at 12:45 and continued further to Mount Wilson (3790'). 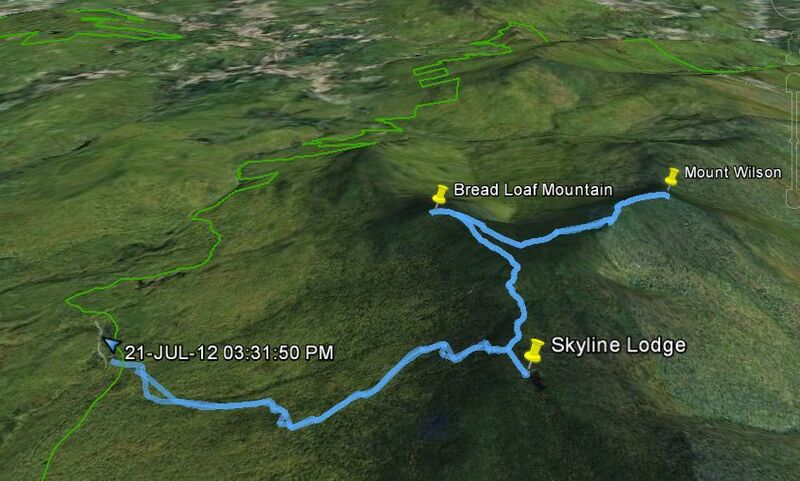 Both Bread Loaf and Wilson are on the Vermont 3500' list. We got to Mount Wilson at 1:15 PM and it was time to turn around. Other commitments meant that we had to be back at the car and on our way home by around 3:30, so we retraced our steps on the Long Trail and dropped back down the Skylight Pond Trail.